Technical fabrics are lightweight fabrics which are engineered to perform various functions for the wearer. Unique properties are engineered into each fabric including strength and stretch, density, resistance to wind and water, retention of warmth, elimination of unwanted moisture, and shrinkage. We use the same fabrics for our dogcoats that you wear when hiking, biking, skiing, skijoring, playing outside. These are the top of the line in each of their categories. For example, Power Shield helps maintain stable core temperature. 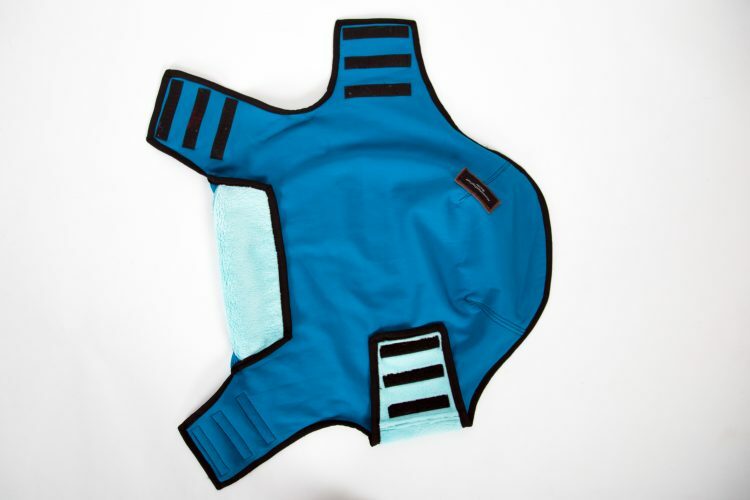 That means it has a membrane with cells that expand and contract depending on your dog’s level of activity. If he/she stops running the cells will contract to keep in warmth. When running begins again the cells expand to release unwanted heat. Each fabric has different features and does a different job. We suggest your dog has a raincoat, winter coat and sweater for different seasons and weather just the same as you.